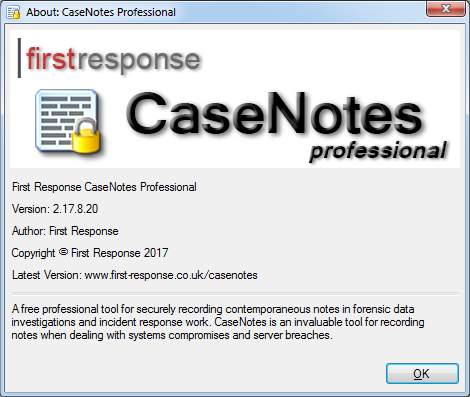 The purpose of CaseNotes is to provide a single lightweight application program to run on the Microsoft Windows platform to allow incident responders & forensic analysts and examiners of any discipline to securely record their contemporaneous notes electronically. This is especially useful as more and more jurisdictions are enforcing regulatory standards for investigations, like ISO17025 in the United Kingdom. CaseNotes stores your notes, checklists and screen captures in a SQLite database that can optionally be encrypted for additional security. It has been used by thousands of forensic analysts around the world since 2003 – we’re very excited to finally release this new version, which has so many new features, based on user requests. CaseNotes is NOT a multi-user application – each analyst should keep their own notes in their own Case File even when working on the same investigation. CaseNotes is not designed to support simultaneous multi-user access and bad things will happen if you attempt this – so don’t! CaseNotes is NOT a case management system – it’s just for recording your notes – nothing more, nothing less. I discovered a minor issue with CaseNotes not displaying notes after they were entered – this is now fixed. Please download the updated version and let us know if you see any issues.